When it comes to choosing the slot machine with the highest possible payouts, it is recommended to play progressive slots. These machines offer possibly the largest jackpots among all slots types. While regular straight slots have fixed payouts that are stated in the payout tables for each machine, progressive slots jackpots are not fixed and can be increased by every bet the player makes. Besides, progressive slots may be interlinked in a whole series of machines where the common jackpot is increased by every bet on every machine. As it was stated above, the jackpot in progressive slots is accumulated by every bet made by the player - and actually by all players in the interrelated progressive slot machines network. Due to this fact the jackpots in progressive slots can reach tremendous proportions. The player who hits the winning combination for jackpot will get the whole jackpot accumulated by every player on every machine. The only way to win jackpot while playing progressive slots is to bet maximum coins. Of course, the layers can make smaller bets and be able to get smaller but more frequent payouts. But winning progressive jackpot requires that the number of coins is maximal. It could be really frustrating to hit the right combination for the total jackpot and be unable to get it as you haven't bet the required amount of coins. Starting the game of progressive slots, one should get acquainted with the payouts table for the slot machine he or she is going to play, find out the amount and denomination of coins the slot accepts and the number of lines available. It is necessary to bet maximum coins on maximum paylines on the machine to qualify for the total progressive jackpot. All this means that to play progressive slots one should prepare a substantial bankroll. 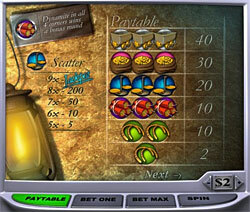 Nevertheless, it is not improbable that the player hits the needed winning combination for the jackpot so high as to return the whole bankroll used and even exceed it. In fact, the payout percentages for progressive slots are lower than for other slots types. The reason for this is that certain fraction of the payback percentages is added to the total progressive jackpot. As the odds to eventually hit this large jackpot are low, the house gets higher hold percentages. It means that although theoretically the payout percentages for progressive slots are fairly high, in reality the players just won't make enough spins of the reels to win the biggest jackpot and realize the potential payout percentage. Prior to playing any type of slots you should look through the payout tables for different machines and, depending on the size of the bankroll you have set for the game, choose the most appropriate and favorable variant for you.